"Phased plasma rifle in the 40-watt range." Plasma is one of the four states of matter, note Technically, it's one of six known forms. The two usually omitted are Bose-Einstein Condensate and Fermionic Condensate. a step up from gas where the electrons become so energized that they break free of their orbits. Naturally some people have thought of weaponizing it. Unfortunately, in real life, plasma's properties make it more than a bit impractical, even without atmosphere it spreads out and becomes useless more than a fraction of an inch from the source, making it useful as a cutting tool but not a (ranged) weapon unless you can practically project a magnetic bottle to contain the plasma until it hits the target...which is very advanced technology in its own right. Needless to say, practical ranged plasma weapons are an indication of a highly advanced civilization. Being considered the next step up the Tech Tree from Frickin' Laser Beams. Bulk, almost always a BFG if not a vehicular weapon. Drawbacks such as lengthy charging time, low battery capacity/high power drain, short range, or a tendency toward Overheating. Usually fires green or blue blobs, although colors may vary. Said blob is a Painfully Slow Projectile compared to beam based energy weapons. Occassionally sets targets on fire or melts them. A Sub-Trope of Ray Gun and Energy Weapon. When the Mohs Scale of Science Fiction Hardness demands the function of the weapon to be explained, however, it's nearly universally mentioned to be a high-powered relative of Magnetic Weapons instead, the implications being that the projectile's launch energy and/or air friction is sufficient to turn most of it into plasma. In Starship Operators the Amaterasu's main weapon is a plasma cannon. Mobile Suit Gundam SEED and Mobile Suit Gundam SEED Destiny has many Mobiles Suits equipped with plasma cannons such as Calamity, Raider, Forbidden, Freedom, Saviour and Destroy. In the Forbidden's case, the beam can be curved. Not quite a cannon, but Accelerator tried to use plasma in its natural state (with his power over vectors to go around the issue of it spreading) to finish of Touma when they first fought. Though the Misaka Clones got together to save Touma. In Event Horizon: Storm of Magic, plasma weapons exist, but are rare due to the previously mentioned impracticalities and their short range. Plasma cutters are still used though, and are often mounted on HULK units used in mining, as the extreme heat melts through rock easily. During the Battle of Outpost B, a White Walker trying to escape containment found out how hot plasma can get the hard way. Tink's weapon of choice in the All Guardsmen Party. Also; some party members get Tau pulse rifles disguised as lasguns. Sources vary on whether the blasters in Star Wars are plasma guns, particle beams, or just inaccurately portrayed lasers. Believe it or not, the Lightsaber is actually a form of plasma gun... Only not a gun. The explanation for how it works, is that it contains superheated plasma in an adjustable magnetic field. The Terminator: The Terminator requests a handheld plasma weapon at a gun shop, which the salesman brushes off as a joke. He then proceeds to rob the gun store of a number of conventional modern weapons. Being from the future, he probably wasn't making it up. The energy weapons seen in the future segments may or may not be examples; it isn't specifically stated. Terminator 3: Rise of the Machines: The T-X's primary Arm Cannon weapon is said to be a plasma weapon. Being a Swiss Army Weapon, she has several alternates built in, including a flamethrower. In the Predator series, the Predators are armed with shoulder mounted plasma casters with distinctive triplicate laser sights. The Bugs in Starship Troopers combine this with their Hive Caste System. The towering bugs that the Mobile Infantry first encounters during their initial ground invasion of Klendathu are so-called "Plasma Bugs". They shoot huge bursts of plasma from their backs to target the human space vessels in orbit around the planet. Two of them are blown up onscreen, but the rest of them end up destroying most of the Federation's Fleet. Pacific Rim: Gipsy Danger is armed with a Plasma Caster. So is Crimson Typhoon, with an updated version of Gipsy's, at the cost of charging time. In the Robert A. Heinlein Starship Troopers novel, Bug Warriors are armed with advanced plasma weapons that are implied to be purely technological in origin. Artemis Fowl Koboi Labs and Police Plaza have plasma cannons that can be set to "stun" or "kill". They are also powered by a tube of plasma that acts like a gel when unpowered and is safe to swim in. The Hammer's Slammers series: Powerguns use precisely arranged copper atoms stored in a plastic matrix. The atoms are pulled down the mirror-smooth barrel of the weapon by electromagnets. The barrels are cooled by liquid nitrogen and air, as most use a rotary assembly. The net effect is a machine gun that ejects plastic discs instead of brass cartridges and hoses cyan bursts that can flash-boil your brain instead of bullets. The Prince Roger series of books includes these as heavy artillery. That they're faulty due to Corrupt Corporate Executives running the companies that manufacture them, costing the lives of some of his marines, is one of Roger's Berserk Buttons. The Kolnar pirates in The City Who Fought use plasma rifles that ignite slugs of U-235. The Bolo stories are centered on the Bolo autonomous tanks, whose usual main armaments are Hellbore cannon, extremely powerful plasma cannon normally found on space battleships. In the RCN universe, ship point defense mounts use plasma cannons, whose lightspeed bolts don't really work beyond relatively short ranges but are quite destructive within those ranges. Instead of destroying incoming missiles, they use ablation to try to drive anti-ship missiles off-course enough to miss.note RCN universe missiles rely solely on kinetic warheads to cause the damage, so as long as they don't connect with the target they're unable to cause damage. As a secondary use, they can strip the delicate sails used by ships to maneuver in hyperspace, to prevent a Hyperspeed Escape. The Takeshi Kovacs novels by Richard K. Morgan have "Sunjet" particle blasters. They're most commonly used to vaporize heads, and the cortical stacks implanted within, thus making it one of the simplest ways to inflict Real Death on people without remote backups. The client in the first book died that way, but had a 48-hour backup enabling him to hire Kovacs to figure out who did it. In the Great Ship, a plasma cannon is one of the very few man-portable devices capable of genuinely killing humanity's Trans Human descendants, as the temperatures destroy the brain, whereas blunt trauma (i.e. from some flavor of BFG) won't even scratch the brain, and the body damage can be healed. In the Nameless War setting plasma cannons are the standard anti ship weapon system. Man portable plasma weapons are technically possible but work poorly in atmosphere as the bolt quickly looses coherency meaning such weapons are generally out ranged by projectile weapons. To the Stars. Tanks with fusion cannons are useful for clearing jungle and other obstacles in the second novel, but in the third novel when the first space battle in history is about to occur, their uselessness at any longer range is lampshaded. Turns out Kinetic Weapons Are Just Better. "Plasma arcs" are common weapons in Lois McMaster Bujold's Vorkosigan Saga. By the time of the main action of the series, ship-mounted plasma weapons have been made obsolete by "plasma mirrors" (which not only block plasma fire, but can be used to reflect an enemy ship's fire back at itself), but plasma arcs continue in use as heavy hand weapons for anti-materiel (and anti-personnel) use, along with several other kinds of energy and projectile weapons. Star Trek: Enterprise: Before Phase Cannons were installed, plasma weapons were used regularly by the NX-01 Enterprise. The time-traveling Nah'kul also had these weapons, having provided them to the Nazis in an alternate timeline. The German military mounted these weapons on their fighter planes. Plasma weapons haven't been used since the pilot episode, probably because of their extreme inaccuracy. The Enterprise is shown not to be able to hit anything with them. In another episode (pre-phase cannons), they're testing spatial torpedoes. When those fail, the crew acts as if the ship is defenseless, forgetting about plasma cannons. In fact, the only time a plasma weapon is successful is when a farmer shoots a pissed-off Klingon with a plasma rifle. Babylon 5: Plasma-based weaponry was used by both starships in the form of large-scale plasma cannons and PPGs, "Phased Plasma Guns", which were handheld weapons that varied from the size of a small pistol to an assault rifle-sized device. The in-canon justification of this is that they are safer for use inside a spaceship or space station than kinetic weapons, as the bolts will dissipate harmlessly if they strike a large conductive object (like the inside of a hull). Star Trek: The Original Series: The original Romulan Bird-of-Prey encountered in the episode "Balance of Terror" had a high-powered, faster-than-light plasma-based weapon that was very destructive, but had limited range, and due to power constraints, could not be fired while the ship was cloaked. Plasma torpedoes are also mentioned in passing as armament used by the Cardassians and the Kazon in successor Star Trek series. Farscape: Sheyangs made prominent use of Plasma Weapons on their ships; several other species did as well, and handheld plasma weapons were mentioned on occasion. Blake's 7: Terran Federation pursuit ships and planetary interceptors are commonly equipped with "plasma bolts", which can home in on (and strike) a target faster than light with accuracy and precision. They project enough force to destroy most unprotected space-based objects and craft in a single strike. Smaller Federation military vessels may be armed with up to four plasma bolt hardpoints. In Warhammer 40,000, almost every race in the game has access to some form of plasma weapon, most often for a squad's special weapons guy. The Imperium, Orks, and Chaos Space Marines have high-damage, but unstable plasma weaponry that shoot balls of plasma, scaled as pistols, rifles, and of course as a plasma cannon, and scaled up even farther with Titan weaponry. They're powerful enough to cook even the most well protected troops with a single shot and a lucky hit can even punch through all but the heaviest of vehicular armor. The downside, other than being hard to make and maintain, is that they are prone to overheating, venting, and even exploding in the user's hands, easily killing them if their armor doesn't hold out. Other aliens have better technology than the above three The Tau, who have safe and stable, but comparatively low-powered plasma, and the Eldar and Dark Eldar have stable AND powerful plasma. Some large Tyranids (read:bugs the size of houses) are also capable of generating plasma within their own bodies, although it's more of a mix of unstable chemicals that ignite when spat out and leaves the bug's mouth. The Tau are the most notable, however. The pulse weapons favored by the Tau are technically uses ammunition that starts off as solid-state, but transforms into plasma as it leaves the barrel. They hit less hard than traditional plasma weapons, but have much greater reliability and range, and still have significant stopping power; even the lowly pulse rifle is superior in range and firepower to almost every other basic small arm in the galaxy (including the Space Marine bolter, which fires mini-rockets). They also have ion weapons (which the Demiurg taught them to build), which fire a stream of ions that turn the target into plasma. Unusually for Tau equipment, ion weapons can disable their power limiters to fire an explosive overcharge shot, at the cost of making them unstable. It should be noted that the Tau Codex explicitly explains that their pulse weapons are not plasma weapons. They are particle accelerators. Each of the two barrels of a Tau pulse weapon projects a single charged particle. The weapons have a detachable magazine filled with pre-charged particles. The Tau Ion weapons are explicitly the Tau version of Imperial plasma weapons, though their plasma bolts explode on impact in the lore and are less powerful. "Melta" weapons are considered to be, by certain segments of the fandom, to be behave the way realistic plasma weapons should, although plasma is never referred to when describing them. They fire a beam of immense heat that disperses rapidly, so they can one-shot a vehicle or a building up close, kill most things in one shot just outside of a few yards (or a guaranteed wounding on things that are just too big to die outright), but are practically harmless at standoff range and long range. Their portrayal differs a bit between different media, with tabletop and lore having them as an instantaneous shot, while video games tend to use a continuous beam. That said, fan opinion is typically more leaning towards the idea that they fire microwave beams. GURPS Ultratech has stats for a variety of plasma guns but notes that they are all "super-science" and therefore shouldn't be included in "hard" settings. Traveller has the famous PGMP (Plasma Gun, Man-Portable) and FGMP (Fusion). Both are intended to be used with Powered Armor and expose nearby people to radiation. Larger versions of plasma weapons could be mounted on vehicles and/or used as artillery, such as the Plasma A, Plasma B and Plasma C guns. The most powerful handheld non-explosive weapon in Eclipse Phase is the plasma rifle, however it's also the bulkiest, only fires in single-shot mode, and has to cool off for a couple rounds every two shots. In BattleTech, plasma cannons and rifles (notably not simply the same thing on different scales — there are plasma rifles for conventional infantry and battle armor troops, but also a Humongous Mecha-scale plasma "rifle" that weighs six tons and is considered one of the better "modern" weapons introduced to the game) are among the few energy weapons that actually use ammunition: they flash-superheat a special plastic foam into plasma, then fire that at the target. (Technically the classic 'Mech flamer is another example, as it directly channels and vents fresh fusion-hot plasma from the 'Mech's engine itself; it's better known, however, for embodying another trope.) The Particle Projector Cannon alternates between a plasma cannon and a Lightning Gun depending on the artist and adaptation, but it is always a massive, highly accurate energy cannon that is so bright it can cause permanent eye damage. Battlelords of the 23rd Century. There are 10 different types of Pulse Weapons, each of which fires accelerated plasma pulses. There are also three different types of plasma grenades. Star Fleet Battles gives Plasma Torpedoes to several factions, most notably the Romulans, but also the Gorns and Interstellar Concordium, the latter of which also have the Plasmatic Pulsar Device. Marvel Super Heroes Adventure Game Adventure 3 Fantastic Four: Fantastic Voyages. In the adventure "Crash Test", the Skrull scout ship the Kell'rr Anelle has four plasma cannons. Rifts has them as popular heavy weapons, either direct projecting weapons, as warheads in missiles, and even the occasional Plasma Flamethrower. In Myriad Song plasma cannons actually deal less damage than rayguns (though still considerable) but sets the target on fire and softens their defenses too. Ghibli blades are kind of a melee version. In Paranoia, plasma generators vaporize anything they hit. They're also prone to malfunction, hard to repair (often vaporizing you if you fail) and expensive to replace. And only legally available at Violet clearance. Plasma is one of the many Elemental Powers in BIONICLE. However, it is a minor element, with its most prominent user being a short-lived Elite Mook. Hero Factory: Plasma Blasters were introduced in the Breakout wave. Metroid has the plasma beam, usually the strongest beam-weapon that Samus could get in each game, being heated to the point that it could incinerate lesser beings with a shot, and burn those who survive. In Metroid Prime, where she had other beam weapons available at once, the plasma beam also appears to have a fairly lengthy charge time as opposed to her other weapons, in addition to a limited range when not charged, making it somewhat more realistic than most examples. Metroid Prime Hunters has the Judicator, which actually uses super-cooled plasma, which is capable of freezing people if used. Sounds like bad science, but it actually is indeed possible to supercool plasma to freezing degrees with a laser. Metroid: Other M has Anthony's plasma cannon, which is noticeably more primitive in that it "takes forever to charge". Borderlands 2 plays the trope straight with Plasma Casters: the rare 'E-Tech' variant of the SMG, they act like any other SMG, but fire small orb-shaped pulses of plasma that deal extra damage, albeit for the cost of 2 ammo (they normally have doubled magazines to counteract this) and slower moving projectiles than their bullet counterparts. Different manufacturers with the Plasma Caster variant available to them will feature their own spin on the weapon type, ranging from 'drunk' projectiles to additional splash damage, and unique variants exist with additional effects. Earthworm Jim uses a plasma gun as his primary weapon. Energy weapons in Fallout include plasma pistols, rifles, and grenades. Plasma weapons do more damage than lasers but tend to hold less ammo, have a lower rate of fire and the projectiles are slower (the last is only relevant from Fallout 3 on). They also have the ability to reduce the enemy to a pile of goo with a lethal critical hit. Fallout 3 introduces a more compact version of the plasma rifle, eliminating the "bulky" aspect of it (it isn't significantly heavier than other rifle-sized weapons). Fallout: New Vegas expands on the difference in plasma rifles by retconning it to be the "Q-series" (and showing the series' Super Prototype, the Q-35 Matter Modulator, as a unique weapon), as opposed to the classic Fallout "P-series" (like the Winchester P-94), which are now called "Plasma Casters". Fallout 4 removes the Plasma Casters, but allows for more customization of the weapon, like transforming a plasma rifle into a pistol (and vice versa), into a shotgun or flamethrower-type weapon, or make it fully automatic. They also consume their own unique ammunition instead of using the same ammo as laser rifles. Fallout 76 adds the Gatling plasma as a new heavy weapon, which compared to the Plasma Caster is shorter, more stout, and has a lot more coils around it. The plasma rifle (Doom 3's in particular) does more damage per projectile than the go-to machine gun, and with higher accuracy, but it suffers from slower projectiles, more scarce ammo, and in the classic games an arbitrary one-second delay after releasing the trigger. It does, however, buck the trend of "slow-to-fire" into orbit with its rate of fire: the classic one fires at 700 rounds per minute cyclic, while 3's iteration goes up to a more modest but still considerably high 480. The BFG9000 in the original games is implied to be a plasma cannon, given that it uses the same ammo as the standard plasma rifle. The Project Brutality mod for Doom 2 has the plasma rifle with a charged shotgun blast as its secondary fire, the heavy plasma rifle that shoots slower but with more force and can be used as a plasma thrower, the BFG10k, the big brother to BFG9000 with its main shot, a focused laser, and energy shield, and the BFG11k a rapid fire plasma gatling gun that can fire a powerful plasma beam. "Ooh, I like it! The sugar-sweet taste of heavy ordinance!" The Plasma Cannon in all three games in the Descent series fires massive green blobs that have excellent range and do fantastic amounts of damage to anything they hit. This is balanced off by its marginally higher energy usage as well as rarity. In the first two TimeSplitters games, the plasma rifle is basically a sci-fi version of the machine guns, with a few differences; rather than needing reloading it overheats if fired for too long, it fires faster as it begins to overheat and its secondary fire grenade launcher fires a sticky plasma grenade (rather than the conventional grenades the "Soviet Rifle" fires). The third game removes the secondary fire from rifles and instead makes the plasma rifle a more powerful, slower version of the automatic rifle from the same era. Dead Space has the Plasma Cutter, a heavily modified industrial tool. The intended use (as seen in Dead Space 2) is to fire a continuous beam that cuts through hardened materials. The modified version instead fires highly damaging beam pulses instead. The pulses have less actual cutting power,note They can cut through hardened materials like steel, for example but are much more useful when it comes to killing things. Galactic Civilizations has ship-board plasma weapons in the Energy Weapons research tier, the description notes that they're technically not "energy" weapons though. Mass Effect 2 has the Geth plasma shotgun added in one DLC. It is a small BFG and basically a secondary heavy weapon that takes the shotgun slot, despite not fulfilling a shotgun's typical role: Instead of spreading close range buckshot it fires three blobs that are actually very accurate and have a slight homing effect if you're using the aim function to make up for the gun firing projectiles instead of being a hitscan weapon like everything else. It doesn't actually shoot plasma, but cluster rounds of superconductive material that creates plasma on contact by superheating and ionizing the air around it. It is very useful against armor and it does massive damage, but has a slow rate of fire. It can be supercharged for even more damage, although it takes significantly longer to fire. Mass Effect 3 adds two new weapons- the Geth Plasma SMG and the Geth Spitfire. The former is a submachine gun that's extremely light but has a huge rate of fire while the Spitfire is a plasma minigun that functions like a massively scaled up version of the SMG. The Spitfire is a support weapon, so you're only able to carry it around and use it on Single Player missions where you find it, though it's available in the multiplayer game as an Assault Rifle. Unlike the Geth Plasma Shotgun, both the SMG and the Spitfire are hitscan weapons and thus avert the slower projectiles aspect of the trope. In Halo, plasma weapons are used by the Covenant. Infantry-scale ones tend (in-game) to be less powerful then ballistic weapons but are much better at draining energy shields, while ship-based plasma weapons are always portrayed as frighteningly powerful and far superior to their ballistic counterpars. In particular, the Covenant use a device in their weapons which can project a magnetic sheath remotely; this can actually be used to "guide" plasma to its target (though it's subject to certain limitations), with its operation is described as being like focusing a series of lenses to adjust the containment as the plasma travels. Purple features plasma gun as one of the available weapons for the player. It's not as powerful as a hammer, but it provides nifty Recoil Boost, which is necessary to get some secrets. In Command & Conquer: Tiberian Sun and its expansion Firestorm the Brotherhood of Nod deployed an advanced aircraft known as the Banshee equipped with plasma cannons. Also Nod's Cyborg Commando was also equipped with a plasma gun. In Command And Conquer 3 Tiberium Wars and its Expansion Kane's Wrath the Scrin make extensive use of plasma weapons. Deus Ex's plasma rifle "superheats slugs of magnetically-doped plastic and accelerates the resulting gas-liquid mix using an array of linear magnets." Too bad this weapon is not held in high esteem among players. Then there's the PS20, a one-shot disposable, cigarette-sized version described as an "emergency weapon". The computer games Dune II, Dune 2000, and Emperor: Battle for Dune. The Harkonnen Devastator Tank is equipped with dual plasma cannons, which fire plasma "shots" over a short distances. They are powered by a nuclear reactor, which can be pushed into a meltdown under certain circumstances. EVE Online: Large scale plasma cannons and plasma railguns are the favored weapon of the Gallente Civilization. First Encounter Assault Recon series: The Type-7 Particle Weapon, a portable sniper weapon which fires a high velocity particle burst that vaporizes a human save for bone material. Freelancer, among a number of other starfighter-mounted energy weapons, plasma weapons have short range and low muzzle velocity but high damage as a trade-off. Pistols and rifles are also seen wielded by the main characters in certain cutscenes. Half-Life 2: While never explicitly described as a "plasma rifle", the Overwatch Standard-Issue Pulse Rifle functions much like the plasma rifles of most FPS games. The main difference is that Pulse Rifles function by using containers filled with dark energy, as clips which expel this material in controlled bursts. They also can fire a compressed orb of dark energy as a form of self-propelled projectile. Dark energy has heat and kinetic damage, and due to the nature of this sort of exotic matter, it causes normal matter to vaporize and cease to exist. Similar weapons are found mounted on the game's enemy warships and vehicles. Homeworld includes many ships armed with plasma bomb launchers, notably the Attack Bomber and Assault Frigate. The semi-canon Homeworld Cataclysm has the Taiidan attempting to increase the rate of fire for plasma bomb launchers. The result is the Energy Gun, an upgrade for mass drivers that fires a self-guided and thus highly accurate plasma bomb. This gives larger ship classes a fighting chance against fighters, yet fighter strafing runs also become more deadly against larger ship classes. The Kuun-Lan's siege cannon is an oversized weapon originally designed to crack the shielding of asteroid bases. It has a range of several kilometers and a massive blast radius. Homeworld 2 features a few ships with plasma-based weaponry, Bombers and Progenitor Movers in a forward mount as well as Progenitor Dreadnaughts in a dual-barreled underside turret. The non-controllable Progenitor Drones are armed with a rapid-fire version. 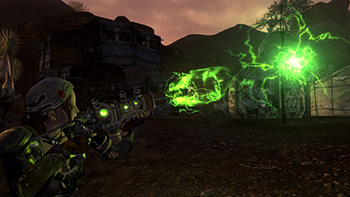 Many mods feature the heavy use of plasma-based weapons. Mega Man series: Reploids [robots] use plasma weapons. The Vanu Sovereignty of PlanetSide use plasma weapons reverse-engineered from advanced technology left behind on Auraxis by a vanished alien species, powered by disc-shaped batteries. Practically, they're not much different from regular kinetic weapons, falling between the Terran Republic's lead-based bullets and the New Conglomerate's Gauss-propelled ferrous slugs in terms of damage, but many VS weapons have the added benefit of their projectiles ignoring gravity (and therefore avoiding bullet drop). Sid Meiers Alpha Centauri: The plasma cannon is a powerful late-game weapon. System Shock: plasma rifle which uses energy, while most other weapons use solid ammo. Total Annihilation and its unofficial 3D open-source variant Spring both include plasma cannon in the place of most tank, infantry, ship and artillery guns. Master of Orion has plasma cannon for your ships, and plasma rifles for infantry. In both games, the plasma cannon is a fairly advanced late-game weapon, and the plasma rifle is the best handheld weapon available. In the second game, plasma cannons have an enveloping effect, which means they deal damage to all four shield sections simultaneously. Also, the Stellar Converter is mentioned to be an extremely-powerful plasma weapon. It's capable of causing an Earth-Shattering Kaboom. Dawn of War has plasma weapon upgrades for Imperial Guard, Space Marines, Chaos Space Marines, and Tau infantry squads. Warhammer 40,000: Space Marine upgrades Captain Titus's bolt pistol to a plasma pistol about a quarter of the way into the game. Larger plasma cannon are also available in multiplayer and at special points in the campaign. In XCOM: plasma weapons are mainstays of the alien army. You can research and reverse-engineer these weapons, making them also mid to late game mainstays of X-COM. Exactly the same can be said on the various clones and descendants of the title, like for example Xenonauts. Sword of the Stars has plasma cannons as the initial medium-level energy weapons. They fire green bolts. Later on, they can be upgraded to fusion (yellow) and Anti Matter (purple). There are multiple kinds of plasma/fusion/antimatter weapons, including triple-barreled heavy mounts and plasma/fusion/antimatter emitters (which fire a short-range cone of bolts). There are also plasma/fusion/antimatter torpedoes, which track their target. Earth 2150 has plasma cannons as the energy weapon of the United Civilized States. It's implied to be reverse-engineered from a UFO at Area 51. Like all energy weapons, can be countered with Deflector Shields, while kinetic weapons and missiles pass right through them. The UCS superweapon is a giant plasma cannon with ballistic bolts guided by satellite. Star Fox: Assault has a plasma cannon that Fox uses in two missions while riding on a teammate's wing, it's about the size of a rocket launcher, is very powerful, and fully automatic. The plasma rifle in Abuse is an unusual example. Instead of firing the familiar blobs or bolts, it shoots rapid-fire beams that quickly dissipate into what look like contrails. In addition to the Plasma Torpedoes carried over from the source material, Star Trek Online also features plasma energy weapons, coming in a wide variety of forms, both carried and ship-mounted. Any captain can decide to use them, and by default the Borg and the Romulan Republic use them. Appears in the HD version of Spelunky, where it appears as an extremely rare Random Drop in a crate or at the top of the Mothership. It's much larger than the player character, has enough recoil to send the PC back a good ways and throw him/her off of a rope, and its shots cause explosions on impact (so be very careful about firing one ). The Particle Projector Cannon in MechWarrior 2 functioned like a plasma cannon with massive damage, extremely slow projectile, slow refire rate, and infinite ammo (but heavy heat generation), unlike the PPC in later Mechwarrior games which were generally nigh-Hitscan Lightning Guns used primarily for sniping. The Mechwarrior 4: Mercenaries MekTek re-release had an actual Plasma Cannon from BattleTech, though its excessive heat generation made it rare on the battlefield. Plasma turrets are the best planetary defenses that can be built in the MMO Ogame. Its the unique defense against which no ships have rapid fire, and flavor text mentions the impressiveness of an approaching bluish ball of plasma as seen from a target ship before the latter is destroyed. Elite: Dangerous features plasma accelerators, which are the most damaging weapon in the game and are one of two types of weapons (the other being railguns) that deal thermal kinetic damage, which makes them capable of tearing through both shields and armour with equal ease, but at the cost of a slow firing rate, requiring huge amounts of power, generating huge amounts of heat, and being a Fixed Forward-Facing Weapon with a Painfully Slow Projectile, meaning you have to Lead the Target manually. The Star Control franchise brings us the Mycon Podships, whose only weapon are fire-and-forget sentient plasma globs. While very powerful at point-blank distances and having a quite decent range, they dissipate with time and fast ships can outrun them and even cause the plasma globs to hit the firing ship. Stellaris has plasma throwers as energy weapons that have higher armor penetration than lasers. Treasure Planet: Battle at Procyon has Plasma Cannons available to the Terran Empire and the Procyon Expanse as an expensive, long ranged weapon. However, despite its name, it resembles and functions like a conventional rifled cannon, instead of a true plasma cannon. Starsiege and its direct predecessor Earthsiege 2 both have the plasma cannon as a heavy weapon loadout for the HERCs. It has decent range, limited tracking ability, and can one-shot a majority of enemy units. Despite this it is inadvisable to use early on as the cannon is not only an energy hog but also destroys any potential salvage from the enemy, which is the currency for repairs, upgrades, and new units. TAGAP has a Plasma Gun that has decent range, fire rate, and power. On top of that, you can also use it to deploy plasma barriers. The titular character of Schlock Mercenary favors the BHG-209 Plasgun. It's barely usable one-handed, makes a distinctive Ominous huuuummmmmm sound when charging up, sears through most body armor, and explodes at the drop of a hat. It's more or less a handheld fusion-powered thruster with "recoil-less" mode, which can be toggled with a flip of switch. When used for propulsion, it allows the quarter-ton amorph to fly around and try aerial acrobatics. Which also means it eats a lot of working medium and expects to take it from air, so in vacuum it fails and around liquids becomes even more dangerous than normally. His first one blew up when he poured beer on it. Later strips introduce the AP-10, which is smaller than most handguns and doesn't have a lengthy charging time; Sergeant Schlock rejects it as "dinky". This actually proves to be a legitimate point; without the glowing barrel and hum the intimidation factor that was most of the weapon's appeal was completely lost. Then he picked up BH-250, looking much the same as his old one. It totals 19.5 kg. S.S.D.D has the Black Rose Mk. II plasma gun. It's powered by a backpack fusion generator connected to the gun by a flimsy hose and is infamous for exploding when hit. Naturally, Tessa owns one. In Vexxarr, the Mahlakosian's Humongous Mecha and Lattrox ships use plasma cannons. The Ecosystems Unlimited compound that Florence Ambrose visits in Freefall has plasma cannons mounted in its guard towers, though after serving as part of a punchline for one strip they're never heard of again. In an Irregular Webcomic! alternate comic, Paris claims that her gun fires ionized plasma. When pointed out that this is a tautology, she points out that he's thinking of a different kind of plasma. In The Doomy Adventures Of Irken Doominess Alyssa's only weapon is her Plasma Gun. While Mega Man in the games uses solar bullets, Mega Man of the Ruby-Spears cartoon uses a plasma cannon instead of a Mega Buster. Plasma blasters are used extensively throughout Lilo & Stitch after Jumba states that a direct hit might stun 626 momentarily. In the first film, one blows up and destroys Lilo's house. In the season 3 finale of Archer, "Space Race", the crew uses Plasma Pulse Rifles aboard the International Space Station. A Running Gag in Young Justice has the Scarab recommending this for everything. At one point, Jaime picks a lock, and the Scarab expresses his disappointment that he didn't just blow the door off. In Buzz Lightyear of Star Command, plasma cannons are outlawed by the Galactic Alliance. When Warp Darkmatter fought Buzz with one, the latter commented on it being added to his list of charges. Warp Darkmatter: "Don't leave out obliterating two Space Rangers, now!" There's some experimental plasma weapons in Real Life such as MARAUDER and Shiva Star. MARAUDER notably fires plasmoids at huge speeds (1000km/s or more) in contrast to typical fictional devices... any slower and the plasmoid would pop before it reached its target. It also wouldn't blast its target to pieces, instead fatally disrupting its electronics rendering it useless. Obviously no good on asteroids and other dumb projectiles. "Casaba-howitzer" devices are effectively focused nuclear explosions... a one-shot brief pulse of 50000K plasma reaching over a relatively short range. A bit like a plasma weapon, but both more powerful and less useful than fictional plasma weapons. Originally designed for peaceful purposes too... nuclear shaped charges are a key part of the Orion Drive design. The prime reason plasma weapons were hitherto considered Awesome, but Impractical is the fact that plasma dissipates quickly when outside a magnetic containment field. A 2013 development, however, has enabled a plasma projectile to generate its own field. While it still doesn't remain stable for long enough to travel any practical distance, this is an important proof of concept that holds significant promise for self-sustaining plasma reactions. Humans being humans, you can bet that the possibilities of weaponizing it will be duly investigated. Functional relatives of plasma weaponry include particle beams and electrolasers. While humans are still taking baby steps, Mother Nature has provided the Pistol Shrimp with a plasma cannon.